beets. they’re what’s in season. but that’s not the only reason to eat them. you already know how good they are for you, you may already like how they taste too. but i’m also fond of them because they’re so dramatic. they’re beautiful. they’re dark and mysterious when raw, and they’re sweet and have a very distinct flavour when roasted, and they’re not shy about leaving their wine-stain pink calling card on everything. i really saw that pink celebrated during my visit to budapest, in beet soup (borsht) of course, but also in creamy beet salads. i only realized that’s what probably inspired this recipe after trying it for the third time. 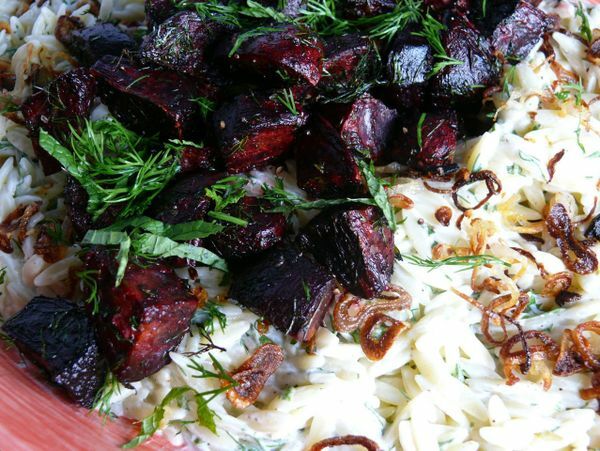 i couldn’t figure out why i had the urge to eat roasted beets on creamy, tangy, dill-y orzo until then. that’s how they do it in the old country! and even though they only play a supporting role in this recipe, you gotta make the shallots if whenyou try this. they add a different sweetness than the beets do, a different onion-y element than their distant cousin, dill, and also, a different texture. plus, they make the finished dish even prettier than even the dark pink beets alone did, if you can imagine it. line a baking tray with foil. toss beets in 1 tbs of olive oil, 1/2 tsp salt, 1/2 tsp pepper, 2 tbs of mint and 2 tbs of dill. spread in a single layer on tray and roast for 1/2 hour. meanwhile, cook orzo in salted boiling water for 8 minutes or until just al dente. strain and rinse under cold water to stop the cooking. shake dry as much as possible. transfer orzo to a large serving bowl or platter and add 1 tbs of olive oil and stir well to coat the grains and prevent them from clumping. in a bowl, combine the yogurt and the feta. 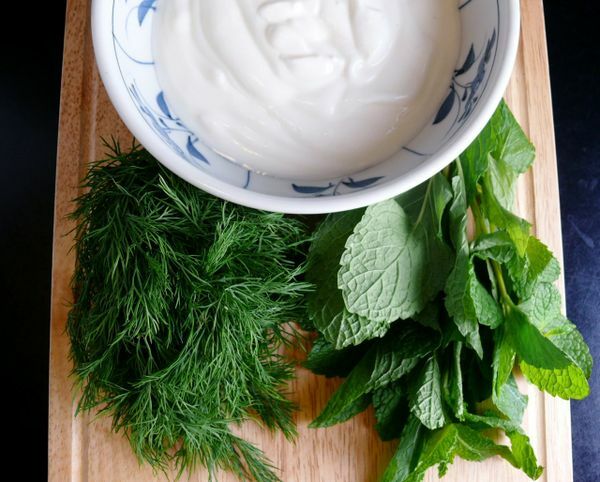 using a fork or the back of a spoon, mash the feta into the yogurt to combine well. add the lemon juice, 1 tbs each of mint and dill, and 1/4 tsp each of salt and pepper. mix well and then pour on top of orzo. mix well to coat the orzo evenly. then heat remaining tbs of oil in a small skillet over medium-high heat. add the shallots and remainng 1/4 tsp of salt. fry, stirring constantly, until the shallots start to brown and crisp up. if the shallots start to burn, turn down heat immediately. remove shallots from heat when they are golden and starting to crisp at the edges. set aside. when the beets are done and fork-tender, remove from oven and loosen from foil. allow them to cool slightly. 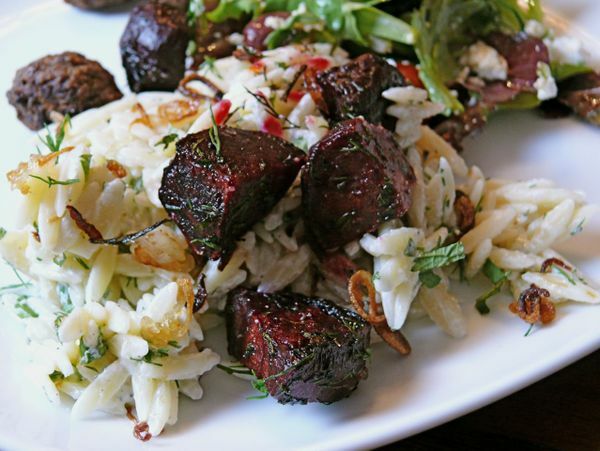 when ready to serve, sprinkle orzo with shallots, then top with beets. serve warm or at room temperature. Orzo, beets, fried shallots. The inspiration! The joy! you should try for your next meatless monday!